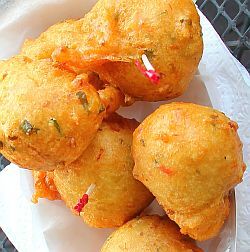 Fish cakes are a traditional Barbados breakfast dish. They may be eaten on their own or served with delicious sweet bakes. For those on the go , the preferred way of enjoying fish cakes is sandwiched in a "salt bread", this is known as a "bread and two". Fish cakes are also a favourite appetizer at restaurants and finger food at cocktail parties. In a bowl, combine the flaked fish with the other ingredients. Stir until a thick batter forms. You can add more water or more flour to get the desired consistency. Drain on paper towels. Fish cakes are best eaten hot! Fish cakes are even more delicious when dipped in traditional Barbados pepper sauce or Marie Rose sauce made by combining mayonnaise, ketchup and pepper sauce. 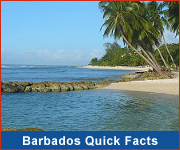 In Barbados we love fish cakes so much, we even wrote a song about them! 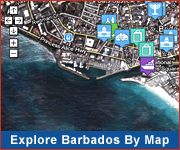 Experience true Barbadian cuisine with this off-the-beaten path tour. Multiple food stops to enjoy as you eat and mingle with the locals! Save time & money: You won't find it cheaper online or anywhere else. Don't be disappointed: Book ahead to guarantee you don't miss out on the best tours & activities.